Reports that two Tibetan teenagers set themselves on fire to protest Chinese rule in Tibet have been confirmed. One is reported to have died from his injuries. Gendun Gyatso and Choekyi Gyatso are both believed to be aged sixteen and carried out self-immolation protests on 9 December in Ngaba County, eastern Tibet. Sources have reported that the teenagers shouted slogans demanding freedom for Tibet during their protests. There are currently no further details due to restrictions imposed by governing authorities on the area – crackdown measures can include shutting down a region’s entire web access alongside mass arbitrary arrests. Of the 150-plus confirmed self-immolations that have taken place since 2009, over 40 have now taken place in Ngaba, which is recognised as a hotspot for Tibetan resistance. Gendun and Choekyi were taken to separate hospitals in Barkham and Khungchu / Kakhog Counties and it has been reported that one of the teenagers has died as a result of his injuries. The two fire protests follow an unconfirmed case earlier this month which also occurred in Ngaba County. 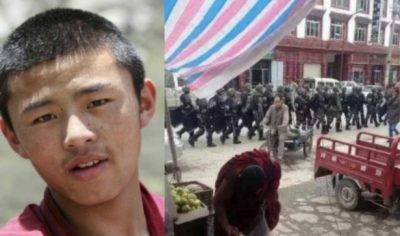 Tibetan news sites claim a man, named as Drugkho and believed to be in his twenties, shouted slogans calling for the long life of the Dalai Lama. Due to an immediate lockdown of the surrounding area, with internet communications completely blocked, no additional details on the incident are available. Sam Wylde, Media & Communications Officer, Free Tibet Campaign.